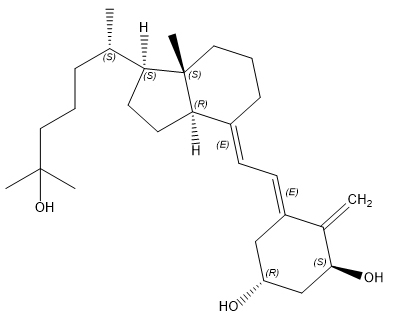 Calcitriol is a metabolite of the secosteroid vitamin D3. This hormone stimulates intestinal calcium transport at a much higher rate than vitamin D3 and hydroxy D3, and is considered to represent the biologically active form of vitamin D3. 3.Prevention of corticosteroid-induced osteoporosis Calcitriol has been used in an ointment for the treatment of psoriasis, although the vitamin D analogue. Calcipotriol (calcipotriene) is more commonly used. Calcitriol has also been given by mouth for the treatment of psoriasis and psoriatic arthritis. Research on the noncalcemic actions of calcitriol and other VDR-ligand analogs and their possible therapeutic applications has been reviewed. Chemical Name: (1a,3ß,5Z,7E)-9,10-Secocholesta-5,7,10(19)-triene-1,3,25-triol Inventory Normally we have Calcitriol in stock.